Films and video from past races. 20th Anniversary Art Print by Stephanie Ryan and other YRQ merchandise for sale. 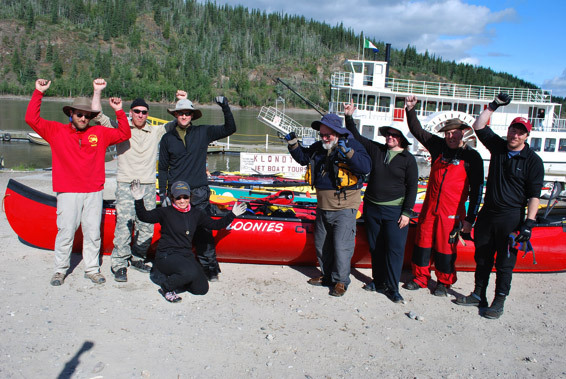 Teams invited to march (with boats, if able) in Sunday’s Canada Day Parade at 11 a.m.
Yukon River Quest Awards Banquet begins immediately following parade (Location TBA). The Race to the Midnight Sun. We hope to have our awards outdoors at the Waterfront Park to accommodate all of our race family!! (and also to show Dawson City just how many of us there are!). Alternate location is Robert Service School. We’ll have a gathering place in our tents all weekend long!!! See our exhibition of photos and history. We’ll ask our previous racers to help us thank the community of Dawson. Banners, bunting, party on the Dyke, July 1st Canada Day Parade. We’re going to pull out all the stops. We’ll all have a great big catered brunch on the dyke with our awards after we walk in the parade. We’ll invite by mail, email and on our website and Facebook.